The rave7 CRM System is not just a simple contact database, but a full blown CRM. Track Accounts, Contacts, Leads, Contact activity, opportunities and so much more. It's where you can track and build relationships with your clients. 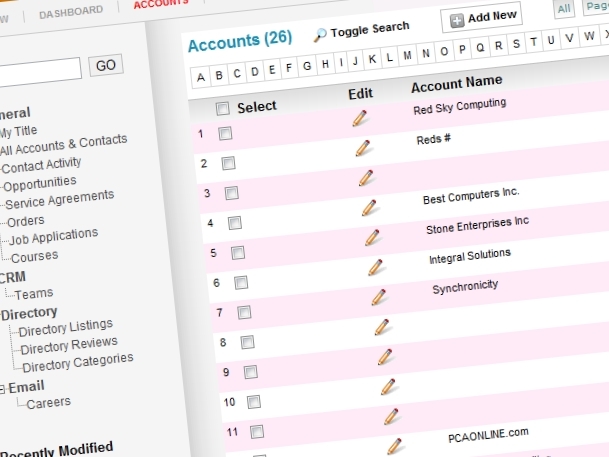 A True CRM Engine - Not Just A Database of Contacts! Simple database development: Build your contact database through direct data entry using the CRM Admin interface, or by importing Excel files or comma delimited text files from external sources. The data import wizard provides a simple data mapping tool so you don’t have to pre-format your input files. Contact record flexibility: Format your contact database to suit your specific requirements, adding profile or segment fields for sorting / reporting, descriptive text fields for reference, transaction or activity history etc. Highly personalized marketing and communication campaigns: Build and execute campaigns based on contact profiles and preferences – no more generic messages that are irrelevant to the recipients! Manage More Than Just Customers! Maintain ongoing contact and build loyalty with engaged customers through scheduled emails, newsletters, blogs, surveys, offers, loyalty incentives, etc. Create and manage forums, sources of online help or resources, downloadable reference material etc.